Some of the documents here may be too technical for most people, but a good resource for doctors and medical professionals. Click on the buttons to be taken to the full articles. "UTI Inc. signed an agreement with Eastwood Bio-Medical Research Inc. of Vancouver, Canada, to license a herbal treatment for safely controlling blood glucose levels for type II diabetics. The treatment was developed at the University of Calgary. Eastwood Bio-Medical has developed the treatment into a product called ELEOTIN." *Disclaimer: Individual results vary. Results not guaranteed. 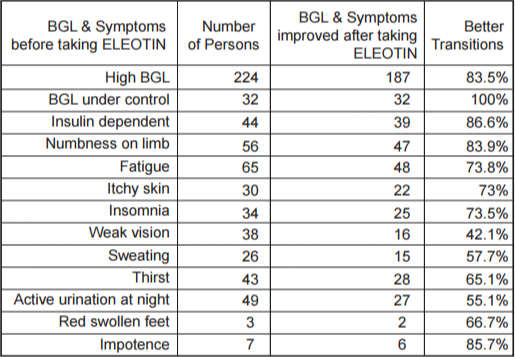 "In general, the blood glucose level (BGL) of all diabetes patients to whom ELEOTIN was administered was lowered over the course of the treatment period." "'We did the original laboratory work,' says Dr. Jiwon Yoon, who chaired the University of Calgary's Diabetes Research Centre. 'This remedy will restore near normalcy for 70% of Type II Diabetics if it is employed within 6 months of onset in an adult subject.'" "This improved insulin sensitivity [from taking ELEOTIN} was not a so-called 'secondary effect' caused by the down-regulation of BGL through alpha-glucohydrolase inhibition. Scientists were immediately excited by the evidence of a primary up-regulation of beta cell activity and insulin sensitivity upregulation-never seen before in the gentle realm of natural medicine. "